When President-elect Donald Trump takes the oath of office eight days from now, he will be completing a remarkable journey, going from private citizen to the highest elected office in the nation without any elected stop in between. But while Trump is, to put it mildly, a unique figure in presidential politics, his journey is one that we are increasingly seeing on a smaller scale at the gubernatorial level. As Reid Wilson of The Hill recently found, there are a striking number of U.S. state governors who never held elected office prior to winning their state’s governorship. About a quarter of them — 13 of 50 — won their first electoral victory of any kind to become the top official in their respective states. Those 13 governors are: Rick Scott (R-FL), Bruce Rauner (R-IL), Eric Holcomb (R-IN), Matt Bevin (R-KY), Larry Hogan (R-MD), Rick Snyder (R-MI), Eric Greitens (R-MO), Pete Ricketts (R-NE), Doug Burgum (R-ND), Tom Wolf (D-PA), Terry McAuliffe (D-VA), Jim Justice (D-WV), and Matt Mead (R-WY). While many of these governors did have significant experience in and around politics and government, they, like Trump, bypassed service in lower-level elected jobs prior to winning their current offices. This is a reminder, as we publish our first overview of the governors’ races coming up in 2017 and 2018, that some of the eventual nominees who contest, and perhaps win, those races may be candidates in the private sector who are not really on anyone’s radar as of yet. So we’re not going to dwell too heavily on prospective candidates at this point; rather, we’re going to take a more general look at the overall environment and which races appear competitive at the starting gate (and which ones do not). More than four-fifths of all Americans live in states holding gubernatorial elections over the next two years. Two states, New Jersey and Virginia, will elect governors in 2017, and 36 other states will hold their elections next year. That includes nine of the 10 most populous states: The sole exception is North Carolina, the ninth-most populous state, which held the nation’s most contentious and competitive gubernatorial contest in 2016. In that race, now-Gov. Roy Cooper (D) narrowly defeated former Gov. Pat McCrory (R). McCrory was the only incumbent governor who lost in the 2015-2016 period, although only six incumbents were on the ballot. Five of six incumbent governors winning reelection is very much in keeping with history: Incumbent governors, simply put, are hard to defeat. More than three of every four governors who sought reelection in the post-World War II era won another term, and the percentage has been higher than that in the past few decades. In recent years where there has been a lot of partisan turnover, the party that gained generally did so by winning open seats. For instance, when Democrats netted six governorships in their 2006 wave year, they only beat one incumbent, Bob Ehrlich (R-MD). Four years later, the Republicans netted five seats amidst a great deal of turnover nationally — 17 of the 37 states holding elections that year switched from one party to another (that includes Rhode Island, which elected Republican-turned-independent Lincoln Chafee to replace a term-limited Republican). Still, despite all that change, just two of the 13 incumbents who ran in that national Republican wave year lost: Chet Culver (D-IA) and Ted Strickland (D-OH). Unlike the 2018 Senate map, where Democrats will be hard-pressed to cut into the Republicans’ 52-48 majority because they already control 25 of the 33 seats up for election next year, the 2017-2018 slate of governors provides many opportunities for Democrats. 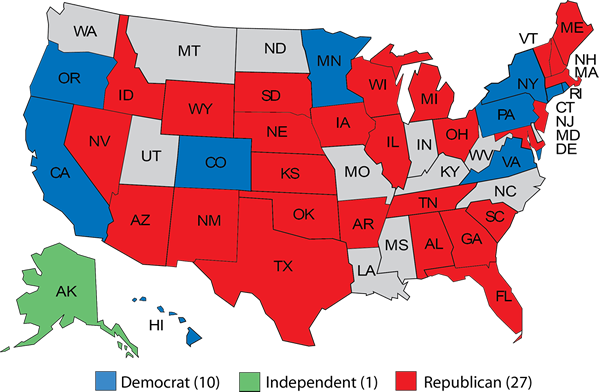 Republicans currently control 33 of 50 governorships, while Democrats hold only 16 (there’s one independent, Bill Walker of Alaska). Of the 38 governorships being contested over the next two years, Republicans already hold 27 and Democrats control 10 (Walker is also up for reelection). Additionally, and here’s where the statistics about the power of gubernatorial incumbency come into play, many of these governorships will be open-seat races. Neither New Jersey nor Virginia will have an incumbent on the ballot in November, and next year roughly half or slightly more of the gubernatorial races will be open seats (a few incumbents are still deciding whether to run again). As we head into the Trump era, history tells us that the president’s party often loses ground up and down the ballot over the course of his term. That extends to state-level offices: Every post-World War II president, starting with Harry Truman, saw his party lose net governorships from when he took office to when he left office. The average loss during the postwar presidencies is 11. It seems likely, though far from guaranteed, that Republicans will lose net governorships during Trump’s presidency: That’s partially because of history and partially because the Republicans already control a lofty 33 governorships, their highest total in the postwar era. Bucking that history is the GOP’s challenge heading into this heavy, two-year gubernatorial cycle. Because the slate of candidates in these races is far from settled, and because it’s not even clear whether some incumbents eligible for reelection will indeed seek another term, we’re delaying issuing our usual race ratings in these contests until later in the year. For the time being, we’re going to divide these races into two categories — those where one party starts as a clear favorite in the governor’s race, and those where there does not appear to be a clear favorite. At this early point, we see one party starting as a clear favorite in close to two-thirds of the 2017-2018 races (24 of 38 states holding gubernatorial contests are listed in this first category). That doesn’t mean that these races won’t be competitive — many of them might be. For instance, nothing about the presidential results in Louisiana (Donald Trump won by 20 points) or Maryland (Hillary Clinton won it by 26 points) would suggest the possibility that Louisiana would elect a Democratic governor or Maryland would elect a Republican, and yet that’s precisely what happened in Maryland in 2014 and in Louisiana in 2015. Gubernatorial races often are defined by local issues that can cut against a state’s partisanship. So just because we see one party as favored to start doesn’t mean when we rate these races later in the year that we’ll be calling them “safe” or “likely” in our ratings. Because of the power of incumbency, let’s start with four Republicans and one Democrat who go into 2018 in a strong position. Govs. Greg Abbott (R-TX), Asa Hutchinson (R-AR), Pete Ricketts (R-NE), and Doug Ducey (R-AZ), as well as Gov. David Ige (D-HI), all won comfortable, double-digit victories in 2014 races, and there aren’t really any indications that they are in trouble as they presumably seek second terms. There are also several red state governorships controlled by Republicans that will be open in 2018. They are, in alphabetical order, Alabama, Georgia, Idaho, Kansas, Oklahoma, South Dakota, Tennessee, and Wyoming. Additionally, South Carolina was slated to be open, but term-limited Gov. Nikki Haley’s (R) likely ascension to ambassador to the United Nations means that Lt. Gov. Henry McMaster (R) will be able to run in 2018 as an incumbent. 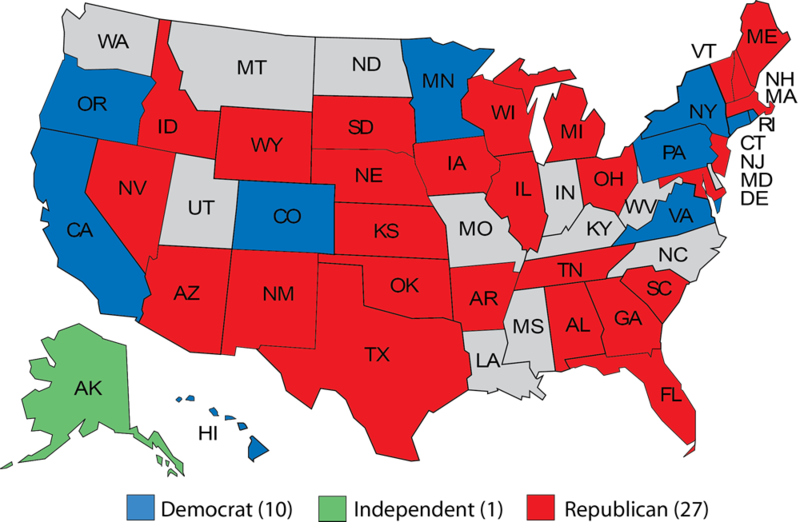 At this point, there’s no reason to believe that Democrats will truly compete in any of these states. However, as recently as 2010, Democrats controlled the governorships in four of these deep red states: Kansas, Oklahoma, Tennessee, and Wyoming. So perhaps Democrats make it a race in one or more of these states. To the extent that Democrats are eyeing these contests, they are focusing on Georgia, which is showing some gradual signs of trending toward Democrats, and Kansas, where outgoing Gov. Sam Brownback (R) is very unpopular (he won his reelection bid by less than four points in 2014, surprising many who believed he would lose). One of the few bright spots for Democrats in gubernatorial races over the past several years was Gov. Tom Wolf (D-PA) defeating incumbent Tom Corbett (R) in 2014. Corbett was extremely unpopular, and Wolf has had a hard time getting much done as he battles a GOP-controlled legislature. As they seek to beat Wolf, Republicans are heartened by Trump’s victory in the state, along with Sen. Pat Toomey’s (R) narrow reelection win, but a deeper look shows positive signs for Democrats, too. The party swept three statewide executive office elections (attorney general, state auditor general, and state treasurer) despite Trump and Toomey’s triumphs. Much will depend on the quality of the Republican nominee, and there are many possible contenders. This is a race we easily could have put in the second group of races, the ones where one party does not start as a favorite, but we’re giving Wolf the benefit of the doubt as the incumbent. Also getting the benefit of the doubt are two under-the-radar targets for Republicans. After taking over for John Kitzhaber (D), who resigned under a cloud of controversy in early 2015, Gov. Kate Brown (D-OR) ran for and won a special election in 2016, although her margin of victory (seven points) was not impressive. She has to run again for a full, four-year term in 2018, and national Republicans are hopeful that they may be able to put the seat in play. On the other side of the country, Gov. Gina Raimondo (D-RI) has struggled with a low approval rating after winning a three-way race with just 41% of the vote in 2014. While the Ocean State is heavily Democratic, it has been open to electing Republican governors in recent years, and Trump did better there than Republicans typically do (although he still lost the state by 16 points). Incumbency and the blue lean of these states make both Brown and Raimondo favorites, but keep an eye on both. Of the six states in New England, generally a Democratic stronghold at the federal level, only two have Democratic governors — Raimondo in Rhode Island, and Connecticut, which we’ll address in the next section. Republicans start as favorites in three of the four seats they already hold because they’ll likely have incumbents running in each: Govs. Charlie Baker (R-MA), Chris Sununu (R-NH), and Phil Scott (R-VT). Scott and Sununu were just elected to their first two-year terms in November — New Hampshire and Vermont are the only two states that still elect governors to two-year terms, not four-year terms. One would have to assume at the starting gate that the voters will give the incumbents another term; however, there is some recent precedent for an incumbent losing after two years: Craig Benson (R) lost his first bid for reelection in New Hampshire in 2004. Meanwhile, Baker has very strong approval ratings in Massachusetts, and it’s unclear whether a top contender will emerge against him. In Maryland, another typically Democratic state, Gov. Larry Hogan (R) also has built up a tremendous amount of good will in his first term, winning admiration for his fight with cancer after he took office. A recent poll by shrewd Maryland pollster Patrick Gonzales showed Hogan’s approval rating at a sterling 74% — but the same poll also showed a significantly smaller number of respondents, just a bare majority (51%), saying they would vote for him over an unnamed Democrat. That shows Hogan is strong, but not necessarily unbeatable. Hypothetically, a well-funded, talented challenger could beat Hogan if things broke right for that person. After all, the only other recent Republican governor of Maryland was Bob Ehrlich, who lost his reelection bid in 2006 despite sporting an above-50% approval rating. Yet Hogan very clearly starts as a favorite, just perhaps not as much of one as Baker in Massachusetts, in part because Massachusetts has more of a tradition of electing Republican governors than Maryland (four of the last five elected governors of the Bay State were Republicans, while Maryland has only had two Republican governors since Republican Gov. Spiro Agnew became vice president in 1969). The two Democratic mega-states, California and New York, also have gubernatorial races next year, and the party should retain both seats as the GOP in both states appears to be a spent force at the statewide level. Gov. Andrew Cuomo (D-NY) appears likely to run for reelection, and he could face a primary from a Democratic Party left wing that believes he is too moderate on certain issues. It’s possible that in California that two Democrats will advance to the general election because of the state’s all-party, top-two primary system. That happened last year in the Golden State’s U.S. Senate race. Finally, Gov. Chris Christie (R) has rock-bottom job approval numbers and is limping to the finish line in New Jersey, where he is forbidden by term limits from seeking a third term this November. To start the cycle, this seems like the best Democratic pickup opportunity, and they begin as the favorite to win the open seat. Phil Murphy, a wealthy former ambassador to Germany and Goldman Sachs alum with no elected experience, is the frontrunner on the Democratic side, though he will face some primary opposition to his left. Examining the 14 remaining contests, the states where there is not a clear favorite to start, helps show the opportunities that Democrats have over the next two years. Of these 14 states, Democrats currently control just four, while Republicans will be defending nine. The 14th race is in Alaska, where independent Gov. Bill Walker can run for a second term. Republicans will not give him a free pass, but national Democrats might — his lieutenant governor is a Democrat and Walker beat a Republican incumbent in 2014. Let’s begin with the Democratic-held seats, starting with the other 2017 contest in Virginia. Our Geoffrey Skelley is writing this week and next on the Old Dominion in depth, so we’ll only add here that the general election looks like a Toss-up at this early point. Gov. Terry McAuliffe (D) can’t run for reelection because of Virginia’s unique prohibition on a governor seeking a second, consecutive term. Democrats are also defending open seats in Colorado, where Gov. John Hickenlooper (D) is term-limited, and Minnesota, where two-term Gov. Mark Dayton (D) has decided not to seek a third term. Both states typically lean a little bit Democratic these days, although Minnesota is not as Democratic as commonly believed — Donald Trump actually performed better in the Land of 10,000 Lakes than he did nationally (losing the former by 1.5 points while trailing in the national popular vote by 2.1 points). This was the first time since 1952 that Minnesota voted more Republican than the nation in a presidential contest. Meanwhile, Hillary Clinton won Colorado by about five points, giving the historically Republican Centennial State its biggest Democratic lean relative to the nation in nearly a century. Several prominent Democrats have already jumped into the Minnesota race, and there could be contested primaries in both states on both sides. It’s just too early to say much about either state at this point — you would probably rather be the Democrats in both states but it is not obvious enough to say they are favored right now. It is unclear whether Gov. Dan Malloy (D-CT) will seek a third term, although Republicans say they hope he does run because they believe they can defeat the unpopular incumbent after two close calls in 2010 and 2014. Connecticut, like some of the other New England states, is open to electing Republican governors, and several Republicans are already expressing interest. Now, on to the nine Republican-held seats where neither side starts as a clear favorite, the majority of which will be open seats. Five of these seats are in the Midwest, a region that swung hard to Donald Trump in 2016 with the exception of heavily Democratic Illinois, where Clinton did about a tenth of a point better than Barack Obama did in 2012. It is no surprise, then, that Gov. Bruce Rauner (R-IL), a wealthy self-funder, is perhaps the most vulnerable incumbent in the country. The other Republican-held Midwestern states are less clear. The second-best Democratic opportunity in the region is probably Michigan, an open seat that could feature contested primaries on both sides. It appears likelier than not that Gov. Scott Walker (R-WI) will seek a third term, and despite often-middling approval numbers, Walker has won three highly competitive statewide races and should not be underestimated. Assuming long-time Gov. Terry Branstad (R-IA) is confirmed as U.S. ambassador to China, Lt. Gov. Kim Reynolds (R) will take over in Iowa, where Democrats don’t have much of a bench (the same is true of Wisconsin and Ohio, an open seat). Again, outside of Illinois, these are all states where some white, traditionally Democratic small cities and rural areas swung heavily toward Trump. Depending on the national mood, they could stick with the Republicans or reject them. Democrats have not won a gubernatorial race in Florida since 1994, although term-limited Gov. Rick Scott’s (R) 2010 and 2014 victories were both by just a little more than a point (the last two statewide presidential contests were also decided by around a point). Both sides expect a punishingly competitive and expensive race. The Democratic field is in flux, with several big-city mayors as well as former Rep. Gwen Graham in the mix, while state Agriculture Commissioner Adam Putnam has long seemed like the leading candidate on the GOP side. Maine, where term-limited, controversial Gov. Paul LePage (R) arguably provided a preview of Trump, is still in the early stages of sorting itself out, and an added wrinkle is that the state now has ranked-choice voting. That’s important in a state where no gubernatorial candidate has won a majority of the vote since now-Sen. Angus King, an independent, ran for reelection in 1998. Sen. Susan Collins (R-ME) is sometimes mentioned as a possible candidate, but even though senators often flirt with the idea of returning home to run for governor, very few seem to take the plunge. (Collins ran for governor, unsuccessfully, before capturing her Senate seat.) The only recent examples we could think of were Brownback in Kansas, who left the Senate to become governor in 2011, and former Sen. David Vitter (R-LA), who lost the Louisiana gubernatorial race in 2015 and did not run for reelection to the Senate last year. That brings us to the final two races, open seats in Nevada and New Mexico. Sitting senators, Tom Udall (D-NM) and Dean Heller (R-NV), considered running in each state, but they have already announced they will stay in the Senate. Outside of Illinois and New Jersey, these open seats may be the Democrats’ two other best pickup opportunities — New Mexico has become Democratic at the federal level, while Nevada, a swing state, narrowly voted Democratic for president and Senate, and also elected a Democratic state Assembly and Senate in 2016. State Attorney General Adam Laxalt (R) could be an early frontrunner in Nevada if he runs since Heller and Lt. Gov. Mark Hutchison passed on the campaign, while the Democratic bench is a little thin because of the party’s setbacks in 2014 statewide races. Meanwhile, Rep. Michelle Lujan Grisham (D) is already running in New Mexico, and state Attorney General Hector Balderas (D) could also run (among others), while the GOP field is as yet undetermined. Republicans start the 2017-2018 gubernatorial cycle in an impressive but vulnerable position. The governorships being contested over the next two years combined with the tendency for the president’s party to lose ground in midterms suggests that the Democrats are positioned to start 2019 with more governorships than they hold right now, but nothing is guaranteed.